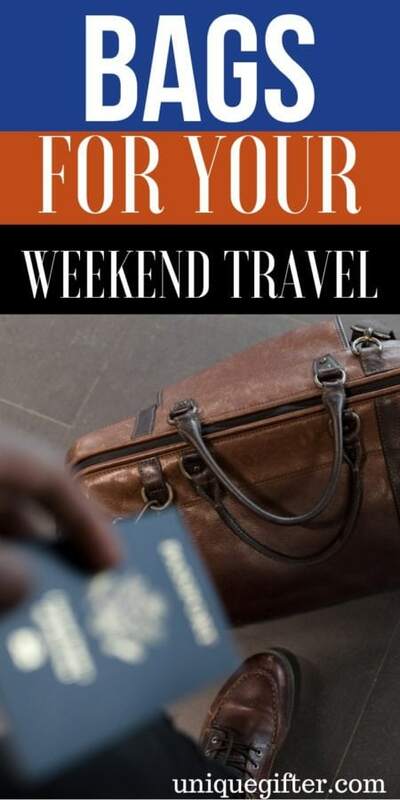 Weekend getaways conjure images of adventure and sunshine and fun. 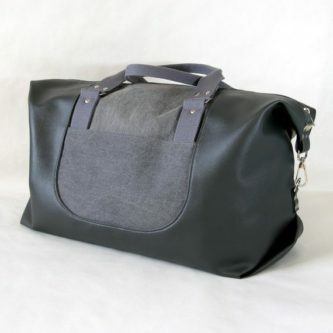 Spontaneity is a good thing but it’s never a good idea to hop on a plane with an ill-conceived or battered travel bag. 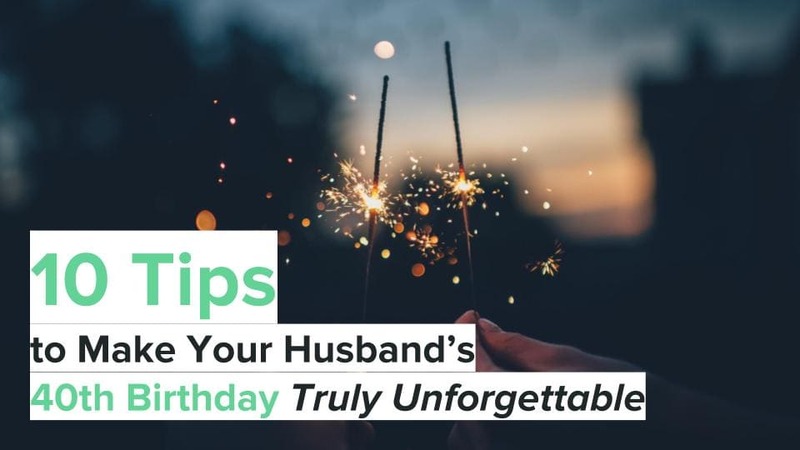 (Ask me how I know!) Never fear, there are dozens of great options to protect your precious toiletries and change of clothes while you dash off into the night. 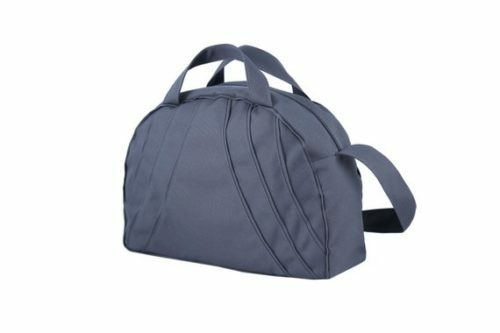 This semi-circle bag is handmade from vegan materials, waterproof, zips shut, and easy to clean. 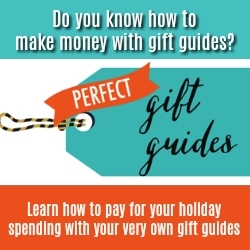 It comes with both short handles and a longer strap. Measures 11 inches tall, 15.5 inches wide, and 5 inches deep. 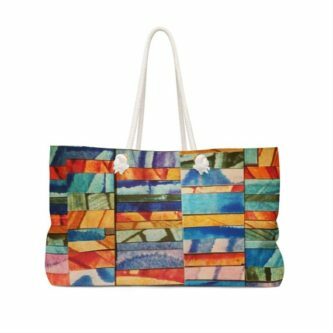 This 24″ x 13″ bag is made of spun polyester and slings over the shoulder with a sturdy pair of rope handles. 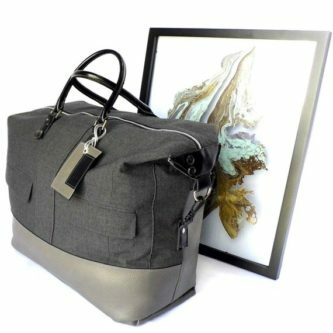 If you’re tough on your bags, or haul some heavy duty gear, this slouchy canvas and leather bag measuring in at 23 x 12 x 11 should stand up to most anything you can throw at it. 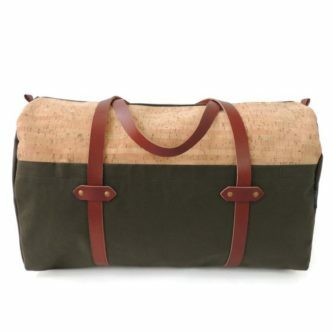 For the artsy traveler, this spun polyester bag with rope handles is a great companion for a quick dip out of town. 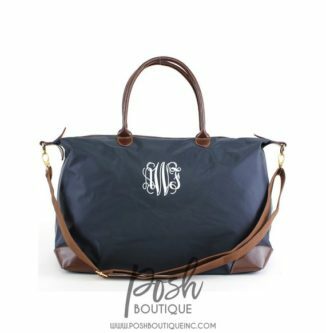 A more formal trim canvas bag, this 24 x 16 x 10 bag can be monogrammed and comes with double handles for handcarrying and a long adjustable strap for over the shoulder use. 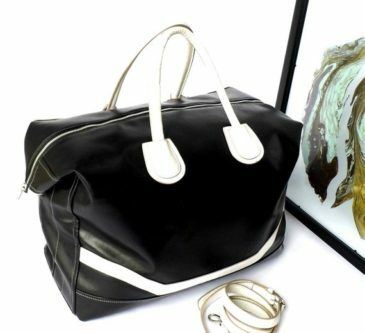 This lovely 15 x 25 x 8 black and white travel bag is made of a combination of vegan and faux leather and can be matched with a garment bag, toiletry bag, and travel wallet. 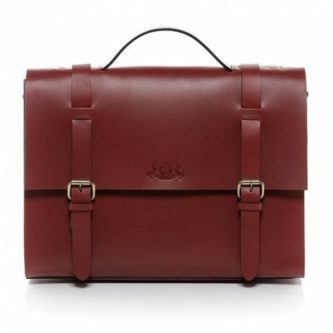 This bag closes with a leather flap and strap, much like a saddle bag. 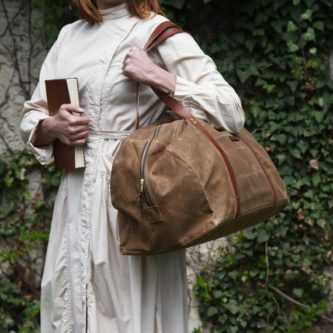 The canvas is waterproofed with beeswax and oil, and the leather straps are sturdy for long wear. 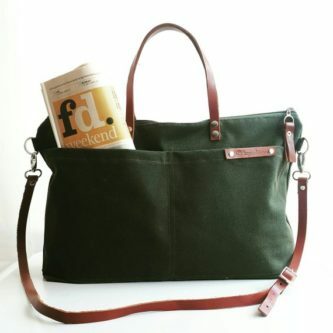 This waxed canvas and leather strap bag is structured like a tote bag rather than a long tube. 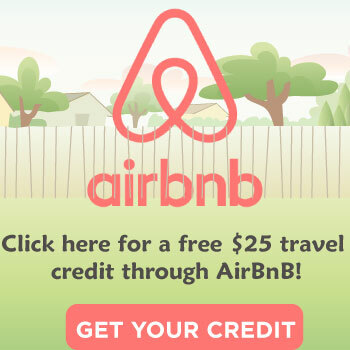 Best for the light packing traveler who doesn’t want to signal that they’re away for a week. Is that a spider? 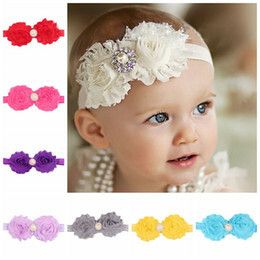 Or is it floral? 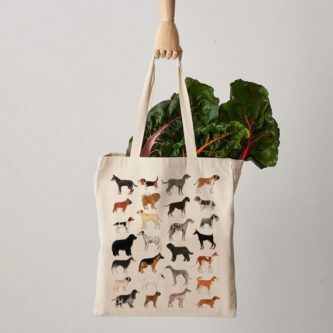 The black on white, or white on black design on this bag just depends on your perspective. 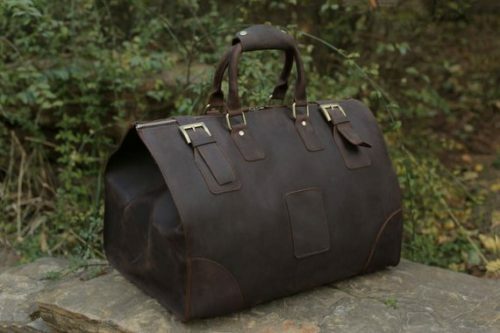 This very structured handcrafted leather bag brings to mind an old fashioned doctor’s bag with a very rectangular body that closes wtih a zipper at the top and is doubly secured by straps on either side of the handle. 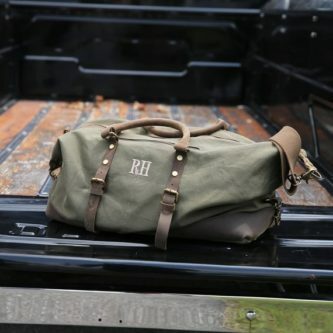 This military design inspired bag is made of heavyweight waxed canvas and silver hardware, and is fully lined. The many pockets give plenty of options for organizing before you head out to grab the train or plane. 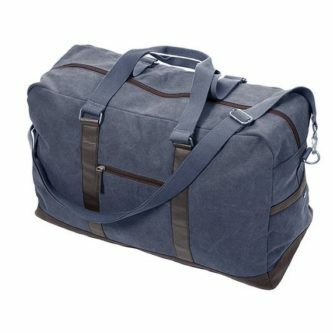 More a tote than a duffle, this 16.5 x 21 x 6 bag made of canvas and cow hide straps is shaped to be large in expanse but slim. 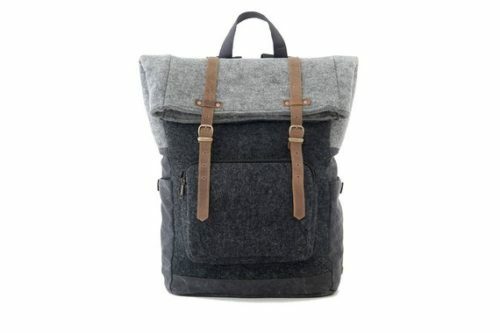 This capacious 17 x 8 x 14 vegan bag comes with a faux leather exterior, cotton interior, and gets away from that classic but possibly boring canvas duffle shape. 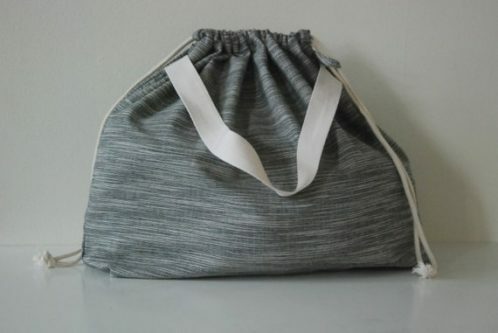 Flash back to the 80s with this fair trade handwoven fabric gym bag with extra long cotton straps. 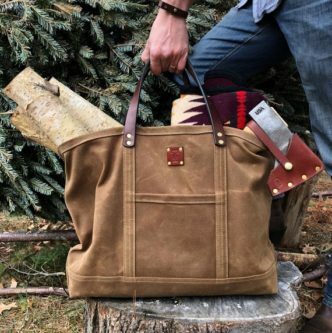 Inspired by an antique Air Force bag, this oversized 14 x 23 x 10 bag is made of waxed duck canvas and held together with brass rivets. The shoulder strap is an available add-on. This very boxy shaped bag combines canvas and premium cow leather with a removable shoulder strap. The top zips shut and includes a magnetic closure. 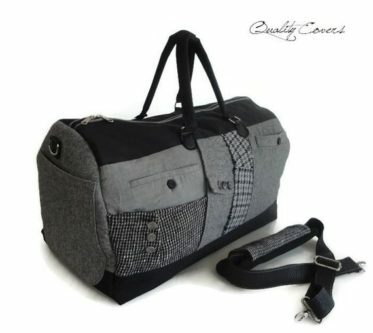 Proportioned to be nearly as tall as it is wide, this 16 x 23 x 8.5 bag is crafted from a wool suit jacket and faux leather to create a truly unique getaway bag. 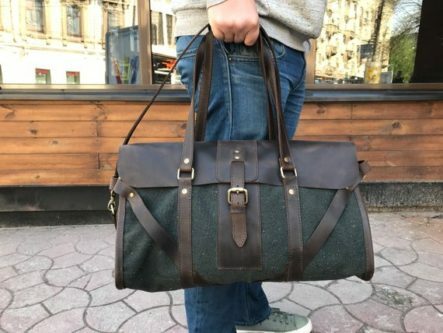 This unique 20 x 12 x 10 bag is created from reclaimed fabrics, ensuring that every single one will be unique, and comes with an abundance of pockets and padding. Wear this felt bag two ways! Sometimes travelers pack extremely lightly and don’t need the full force of a duffel bag, and other times need the whole kit. With this bag, they can have both. Canvas on the bottom, and cork on top! The sustainable cork is naturally water resistant and protects your belongings from a sudden spring shower.